Why Did My Income Change? In many healthcare settings, practitioners have limited insight into why their incomes increases or decreases between pay periods. Modifications to Medicare and Medicaid plans cause healthcare professionals to notice significant changes in their income due to mandated administrative tasks. This healthcare client needed a sense of how they performed financially and service-wise across quarters to identify necessary adjustments. 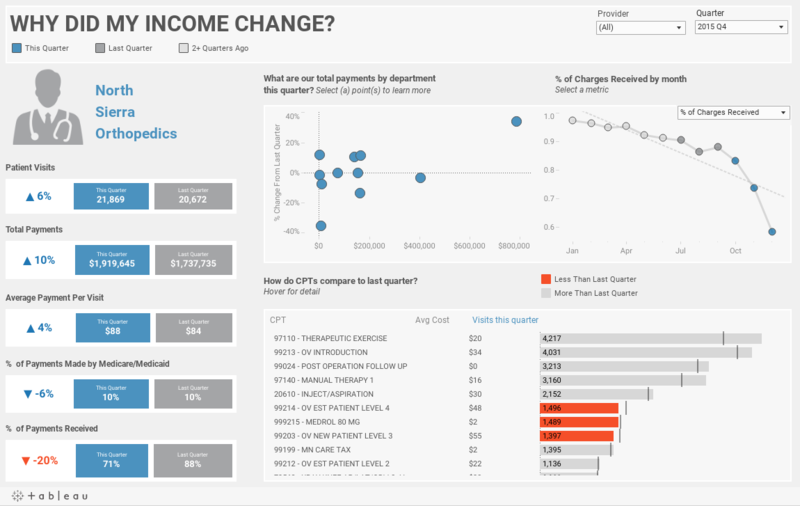 To lend increased insight into these important questions, healthcare professionals must find correlations between increases/decreases in pay and other metrics such as average payments per visit, Medicare/Medicaid payments and number of patient visits. In order to increase patient access to quality care and help healthcare professionals advance their careers, the data must speak to patient volume over time. Patient volume is a key indicator for patient access to care, physician income, and general clinic productivity.